AML and MDS patients failing hypomethylating agents (HMA) based therapies have a dismal prognosis highlighting an unmet medical need for these patients. CD123 (Interleukin-3 receptor alpha chain [IL3RA]) is overexpressed in MDS and AML progenitors and seems to be a promising target for immunotherapy. Talacotuzumab (TAL, JNJ-56022473) is an IgG1 monoclonal antibody targeting CD123 preferentially via antibody-dependent cellular cytotoxicity (ADCC). In addition the antibody inhibits IL-3 signaling to impede proliferation of leukemic progenitor cells. The SAMBA trial of the German and French MDS study groups within the EMSCO network assessed the safety and efficacy of single agent TAL treatment in patients with higher-risk MDS or AML failing first line treatment with HMAs. TAL was given i.v. at a dose of 9mg/kg once every two weeks (14d ± 2d) for a total of 6 infusions and could be continued in responding patients. The study was accompanied by an immune monitoring via flowcytometric analysis to investigate the dispersion of T- and NK cells in blood (PB) and bone marrow (BM) at the time of screening and during therapy in comparison with healthy, age matched controls. Of special importance were NK cells, as they are activated by high-affinity binding by the Fc-region of TAL inducing ADCC at targeted cells. 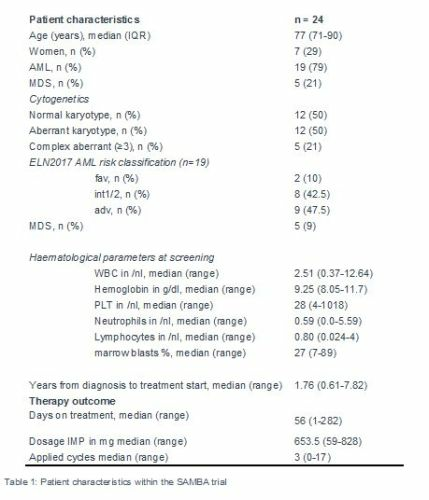 A total of 24 AML/MDS patients having failed HMA with a median age of 77 years were included (Table 1). Therapy resulted in grade 3/4 infusion related side effects (pneumonia, n=1; infusion-related reaction, n=3; septic shock, n=1) in 4 patients, which led to early study discontinuation. Most frequent severe adverse events observed were infections (38%), cytopenias (9%), cardiac and gastrointestinal (7.5%, each) as well as nervous systems disorders (7.5%) in this older HMA-refractory MDS/AML population. Fourteen patients were assessed for response after 4 infusions and 8 after 6 infusions, respectively. Overall, 5 responders were identified; four AML patients with a marrow partial remission and one with a marrow complete remission; none of the responding patients achieved formal hematological improvement. Duration of response in these patients was short (median 1 month, range 1-6). Three patients are still on treatment based on subjective benefit in two of them despite losing objective response and one MDS patient with disease stabilization. Median survival for the entire cohort of patients is 4.8 months (95%>CI, 2.7–8.7). Prior to therapy, patients already displayed a disturbed immune profile compared to healthy controls. In fact, patients had significantly less mature NK-cells (75% CD56 dim NK-cells in patients vs. 87.9% in controls; p<0.01) including a higher expression of inhibiting (NK-KIR) and less activating (NKG2D and DNAM1) NK-cell receptors (p<0.01). Even though ADCC-mediated targeting of CD123 seems to be a promising treatment option, patients with advanced MDS/AML displayed significant alterations in their immune cell repertoire which may have contributed to the moderate clinical benefit with single agent TAL treatment.